The sunshine we've seen in the UK recently has made me so happy! It feels like Spring is really here and although it's slightly scary (as I get married this Summer- eek) it's the best feeling to have the sun on your face and to not have to layer up with scarfs and big coats. 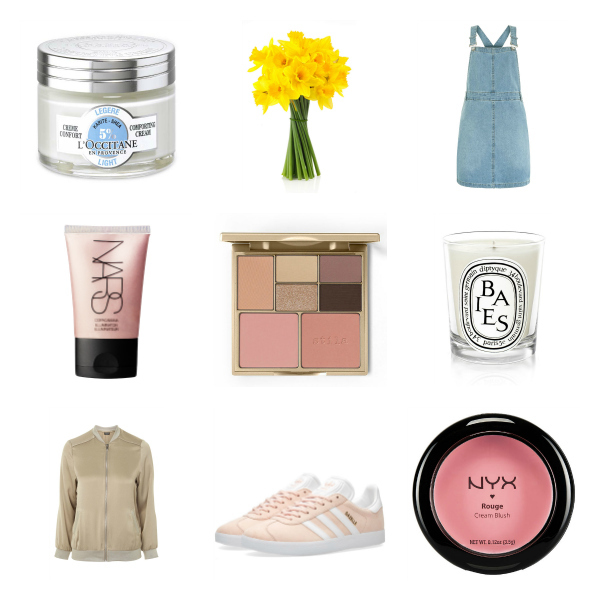 Today I'm going to share my 9 Spring Essentials. 1. L'Occitane Shea Light Comforting face cream. I always find that my skin struggles a little when it emerges from the cold winter weather - it's very dry and doesn't feel very bright so a moisturiser is an essential. The Shea Light offering from L'Occitane is great as it's lovely and light, and so perfect for Spring when you don't feel like a heavy product. 2. Daffodils. Having daffodils around the house really brightens up the rooms and brings spring into the home. I love how cheap they are and how quick they are to open and look beautiful - our only issue is that Chris doesn't like to seeing a dying bunch in the shop so will always buy them so they have a chance to 'thrive'. Bless him! 3. New Look pinafore dress. This is in the sale for £9.99 so an absolute winner - I love a pinafore and have just bought two new denim ones. So easy to wear and I like how they can be worn in the awkward transition between cold and warm weather. 4. Nars Illuminator in Copacabana. I'll be honest, I like to wear a highlighter all year round but in Spring/Summer you can really go for it. I like to mix the Nars Illuminator in with my foundation to make it feel lighter and to add a lovely glow. 5. Stila Perfect Me, Perfect Hue Eye and Cheek Palette. I've just discovered this palette but oh, it is so pretty and so perfect for spring time! I have a nostalgic love for all things Stila and have always rated their blushes. I feel like I could use this one palette for months. 6. Diptyque Baies scented candle. Although I can't spell both the brand and the name of this candle, this is my absolute favourite scent for Spring. It's a mix of blackcurrant and rose and is just light, fresh and floral. Love! 7. Topshop bomber jacket. I find that my go-to jacket for Spring time is a bomber. I find they 'make' an outfit and they keep you warm, without acting like a big winter coat. Very much enjoying the satin and suede variations that are popping up at the moment. 8. Adidas Gazelles. I am lusting after these trainers and having to make do with a knock-off from Primark. I like how trainers are being worn everyday, rather than just at the gym as they are so comfy! These look great with a bomber and jeans. Such an easy outfit. 9. NYX Cream blush in glow. Although the MaxFactor creamy blush is one of my faves, this blush from NYX is gorgeous. I love wearing a cream blush in the warmer months as it settles into skin so much better than powder and looks so much more natural in the bright daylight.